Say what you do. Do what you say. Document it. Every time. Our operations are ISO 13485 certified for the design and manufacture of medical packaging. 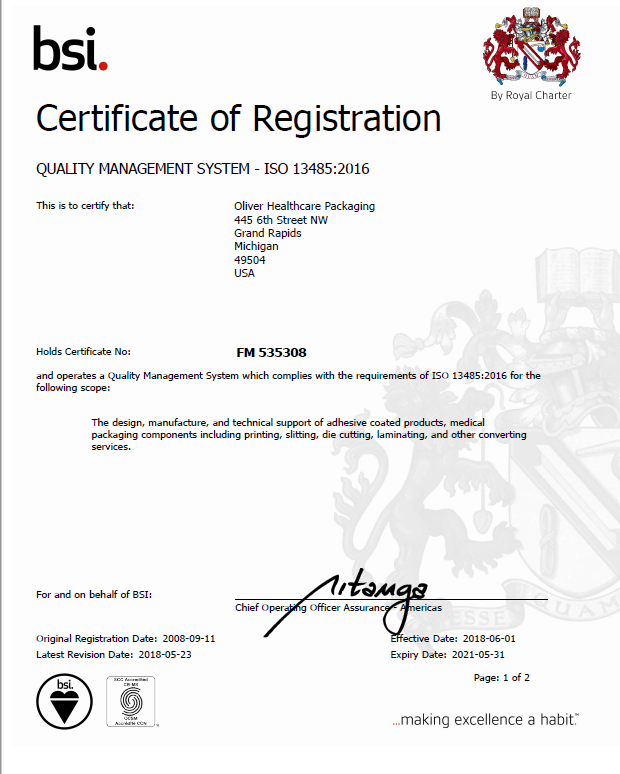 Oliver Healthcare Packaging’s Grand Rapids, Michigan, USA, Hamilton, Ohio, USA and Venray, the Netherlands facilities are ISO 13485:2016 certified, ensuring the consistent delivery of products and services that meet customer and regulatory requirements and facilitating compliance with global regulations. 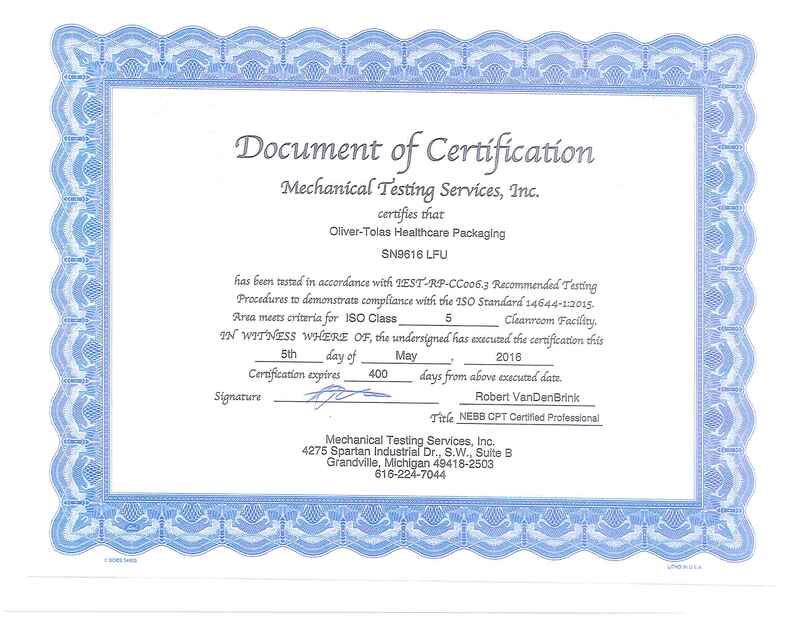 Oliver Healthcare Packaging, LLC and Oliver Healthcare Packaging BV are registered by BSI, certification number FM 535308. Oliver Healthcare Packaging’s facility in Suzhou, China is ISO 13485:2016 certified, ensuring the consistent delivery of products and services that meet customer requirements and achieve customer satisfaction while pursuing continuous improvement. 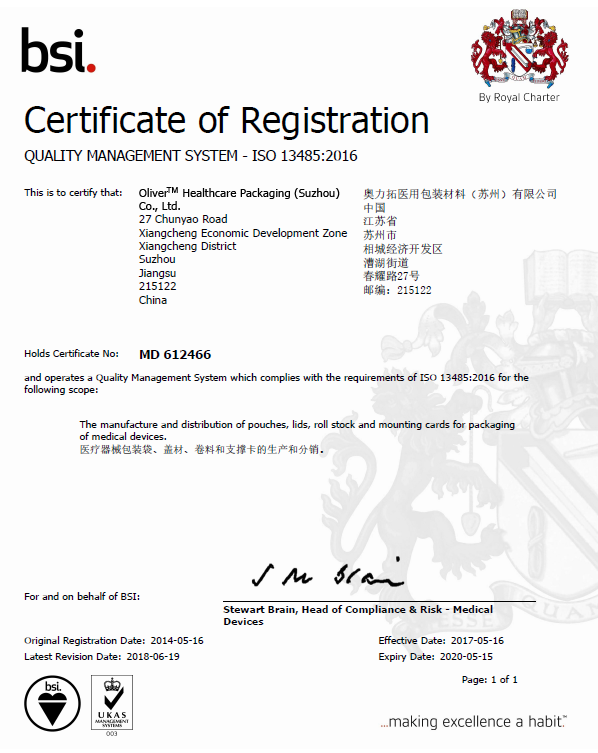 Oliver Healthcare Packaging is registered by BSI, certification number MD 612466. 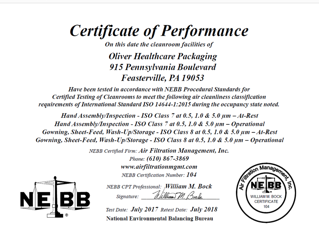 Oliver Healthcare Packaging’s New Britain, Pennsylvania, USA, facility is ISO 13485:2016 certified, ensuring the consistent delivery of products and services that meet customer and regulatory requirements and facilitating compliance with global regulations. 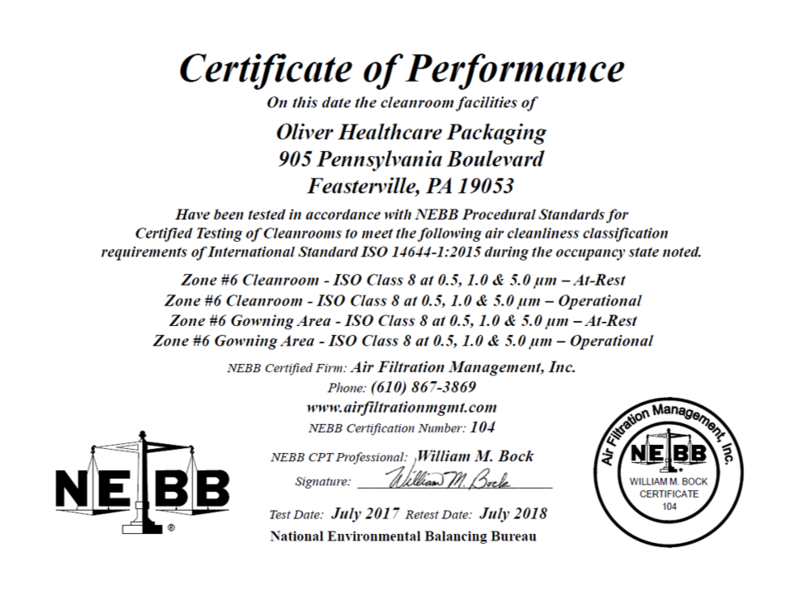 Oliver Healthcare Packaging’s facility in Feasterville (Philadelphia area), Pennsylvania is ISO 13485:2016 certified, ensuring the consistent delivery of products and services that meet customer requirements and achieve customer satisfaction while pursuing continuous improvement. 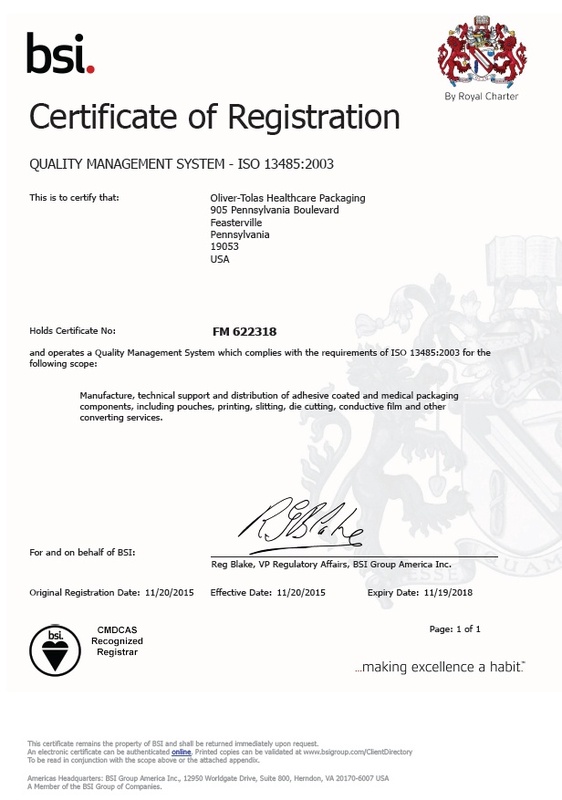 Oliver Healthcare Packaging is registered by BSI, certification number FM 622318. 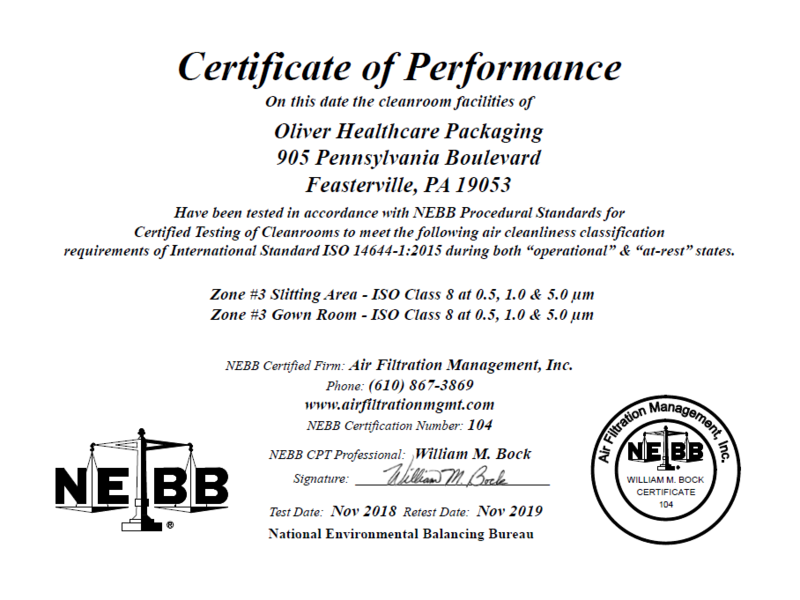 Oliver Healthcare Packaging's material, tooling, gowning, and work areas lids are certified class 8 in compliance with ISO 14644-1. 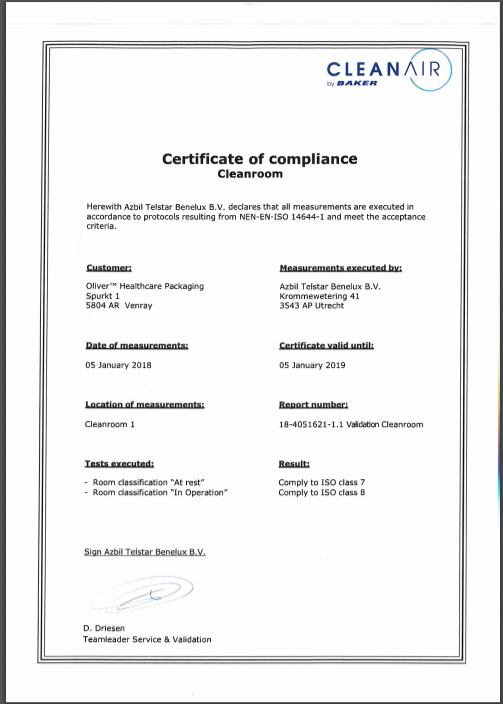 Oliver Healthcare Packaging's work and inspection areas for zone-coat lids are certified class 7 in compliance with ISO 14644-1. 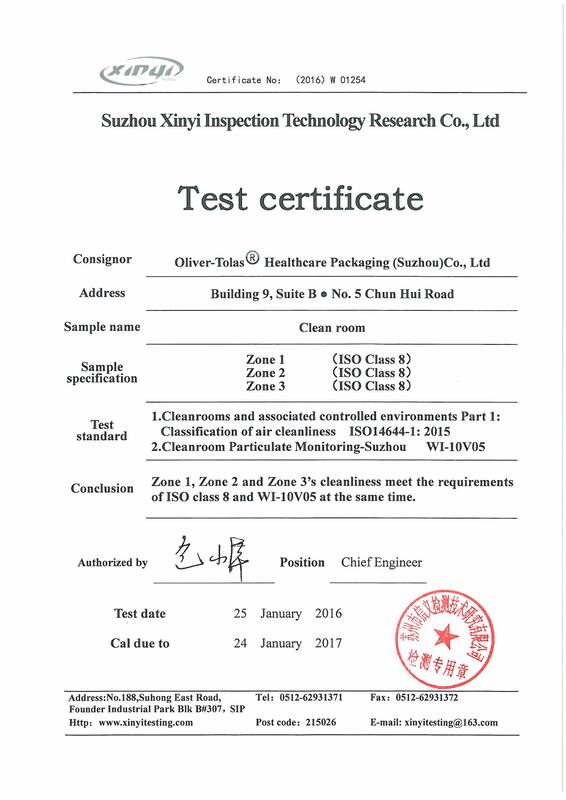 Oliver Healthcare Packaging inspection, testing and packaging areas for Oclean® products are performed under certified class 5 Hoods in compliance with ISO-14644-1. Oliver Healthcare Packaging's work and inspection areas for hand assembled products are certified class 7 in compliance with ISO 14644-1. 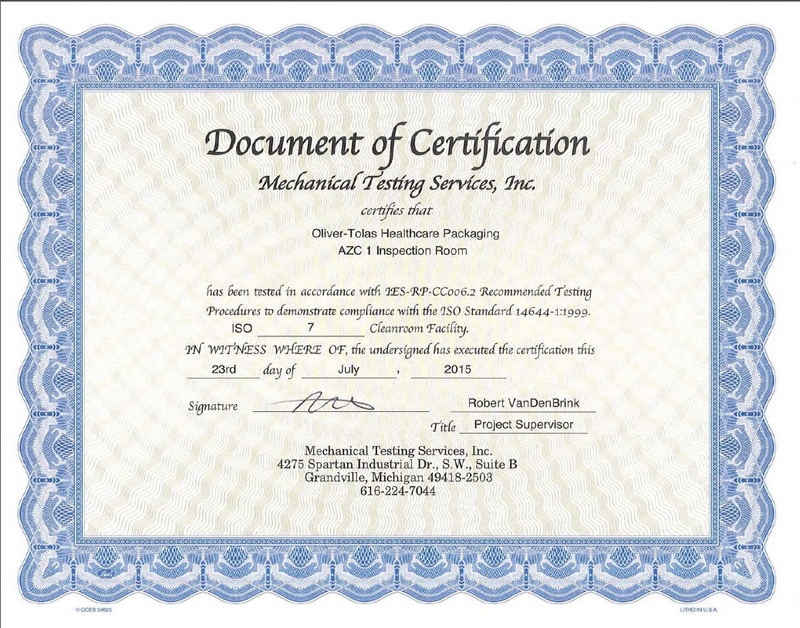 Gowning for hand assembled and sheet fed products, and sheet fed work areas are certified class 8 in compliance with ISO 14644-1. 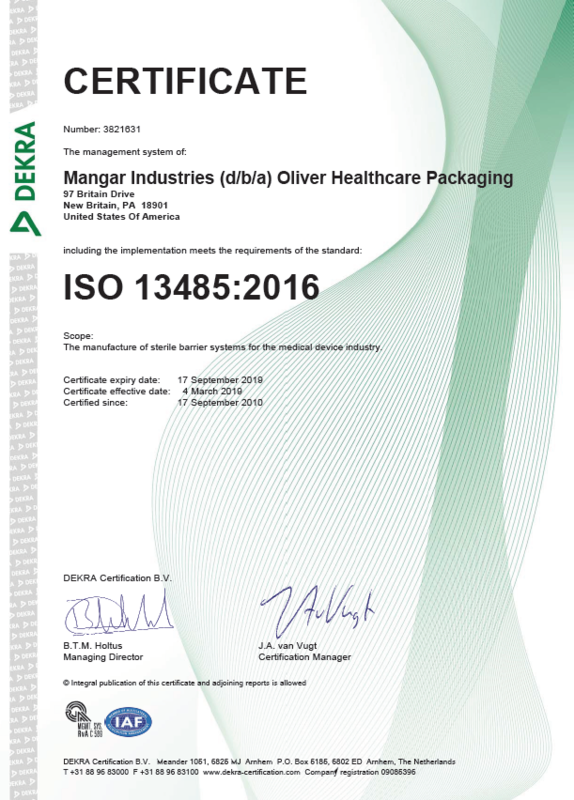 Oliver Healthcare Packaging's work and inspection areas for pouch production are certified class 8 in compliance with ISO 14644-1. Gowning for pouch production, and work areas are certified class 8 in compliance with ISO 14644-1. Oliver Healthcare Packaging's work and inspection areas for slitting operations are certified class 8 in compliance with ISO 14644-1. 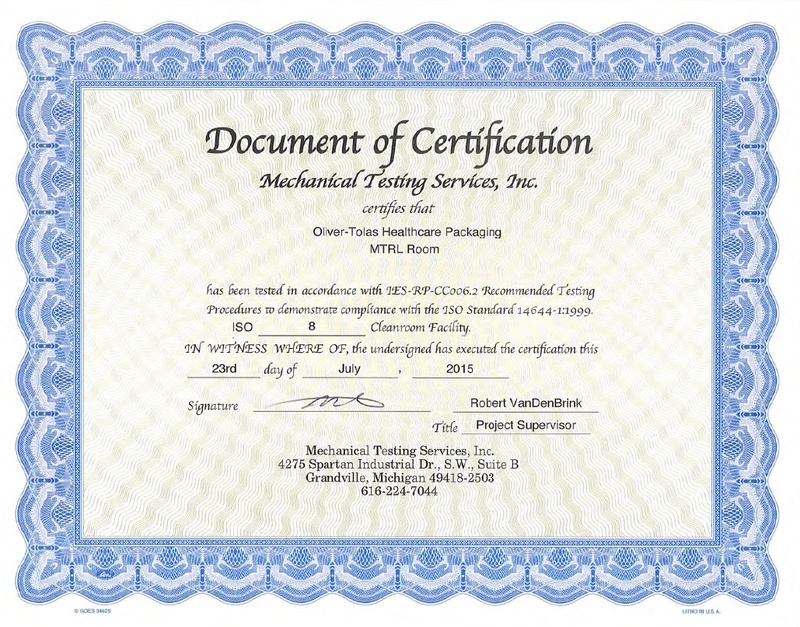 Gowning for slitting operations are certified class 8 in compliance with ISO 14644-1. The Oliver Healthcare Packaging's facility in Venray, The Netherlands, features printing, materials, and gowning areas that are certified class 8 in compliance with ISO 14644-1. The Oliver Healthcare Packaging's facility in Suzhou, China features printing, materials, and gowning areas that are certified class 8 in compliance with ISO 14644-1.